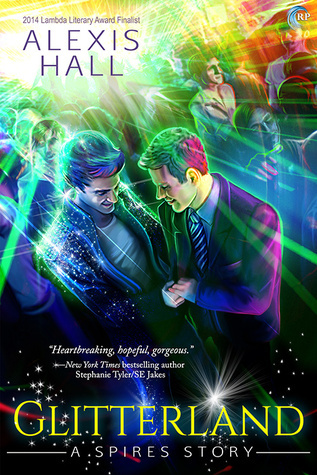 Glitterland by Alexis Hall was recommended to me by my friend and fellow author Luna Harlow (whose review of it can be found here), and I am so, so glad I took her up on the rec. Spoilers: I loved it. Glitterland is the story of stuck-up novelist Ash Winters, post-breakdown and suffering from anxiety, depression, and bipolar disorder. When he runs into aspiring model and Essex boy, Darian Taylor, who he can only describe with the words glitter pirate, Ash absolutely intends to have no more than a casual hookup with him. But despite himself, Ash finds himself drawn to Darian's honest good nature, even while he's ashamed by his awareness of what the people around him, who already think less of him due to his breakdown, will think of him for being with someone so lower-class. And mental illness is no fun ride, either, making him want to ruin his own happiness. But is it possible that being around someone who doesn't want to fix him—someone who just wants to be there with him through the hard times as well as the good—can help him move forward? This book had me from page one. I've had anxiety attacks before, and the description of how he felt was so horrifically familiar. All kudos to Alexis for being able to describe it so aptly—and everything else besides. The prose in this book is lovely, and the writing feels like what I'd expect from a first-person narrator who is also a literary author. Beyond that, the character writing is wonderful. Everybody is complicated. Characters frequently say terrible things because they're hurting; that doesn't make them terrible, and the narrative doesn't give them a pass for the terrible things they say even while it understands and empathizes with them. The writing is careful about these things most of the time; for example, one character early on says something unpleasant about bi people, but the narrative itself shows the bi character happy, genuine, and loving, and also shows that the rudeness of the speaker there is rooted in his own current pain. In a lot of ways, this story is about words. What people say that they don't mean, what people don't say that they do, and when it's time to try to balance that back out again. It's also about taking responsibility versus acting out of guilt, and admitting culpability versus self-hatred. It's a book that is very kind to itself and the characters in it while not going easy on the terrible things people can do to each other when upset, guilty, afraid. As I said earlier, it's also about mental illness, and how hard it can be both on the person with it and those around them... while not blaming them for it, not acting like behavior is immutable, and accepting, too, that sometimes executive dysfunction is part of it. Sometimes sadness happens. Sometimes worse. It treats it as something Ash is living with (and sometimes doesn't know how to live with), and doesn't either victimize him for it or hate him for it. It feels very, very genuine. It's also really darn cute, which is incredibly impressive when dealing with material as heavy as this book does. I found myself smiling throughout the whole thing, and sometimes sending my fiancee quotes. The characters are charming and the dialogue is witty and it was fun. Ultimately, it was a book I had faith in to do its best by its characters, and it lived up to that. Sign into Goodreads to see if any of your friends have read Glitterland.